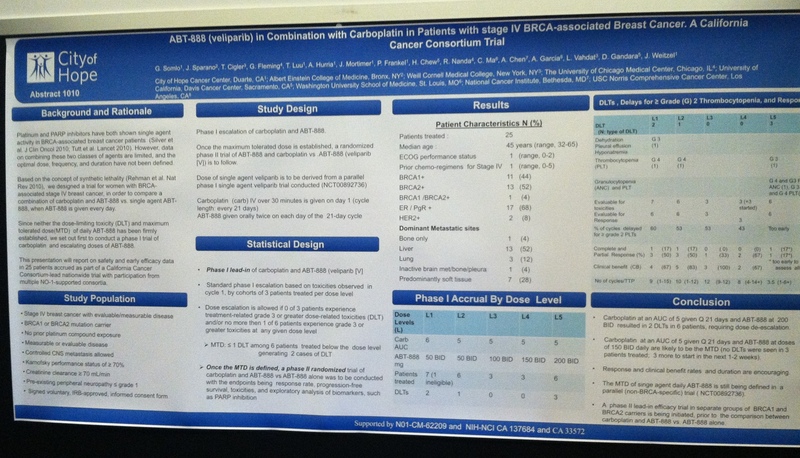 In a poster presentation this week at the American Society of Clinical Oncology (ASCO) conference, researchers presented results from a nationwide study assessing a PARP inhibitor in BRCA-associated breast cancer. Dr. Tessa Cigler is the principal investigator of the study, “ABT-888 (veliparib) in combination with carboplatin in patients with stage IV BRCA-associated breast cancer,” at the Weill Cornell Breast Center. Platinum and PARP inhibitors have demonstrated activity when used as single agent therapy in BRCA-associated breast cancer. However, there is limited data on using the two classes of medications together. The study enrolled 22 women with BRCA-associated stage IV breast cancer to compare a combination of carboplatin (platinum-based chemotherapy) and ABT-888 (veliparib, a PARP inhibitor) vs. single agent ABT-888, when ABT-88 is given every day. ← Report from ASCO Seminar: What’s New in Metastatic Breast Cancer?